Rosario Marchese‘s quest to make Toronto exempt from the decisions of the Ontario Municipal Board (OMB) took a step closer to realization. The private member’s bill put forward by the NDP representative for Trinity-Spadina would give Toronto, and not the provincially appointed board, the last word on planning issues in the city. And despite reservations from both the Liberals and Conservatives, the bill passed a second reading on Thursday afternoon. This way, if city council were to nix a development proposal, the buck would stop there. Developers would no longer be able to ask for a hearing at the OMB. MPPs from cities such as Barrie and Ottawa both chimed in that the appointed board held too much power over local planning issues. The general feeling at Queen’s Park was that the OMB is pro-development and quite often goes against the wishes of city council, planners and local communities. The public gallery was packed with Torontonians including a few heritage advocates. Regardless of party, most MPPs did show concern about the unelected board’s powers. Though the Liberals started off by saying they were open-minded to the proposed bill, they did express concern about where the new planning conflicts would take place. Though residents and community groups have expressed concern over the legal costs of fighting developments at OMB trails, some Liberal MPPs suggested that removing the OMB would just bring these battles to the courts, which could be even more time-consuming and expensive. Conservative MPPs thought the Bill was too Toronto-specific and shouldn’t just single out the big city as exempt from the board. Marchese’s bill has had support among city councillors such as Adam Vaughan and Kristyn Wong-Tam, who held a press conference Thursday to announce their support of the move. 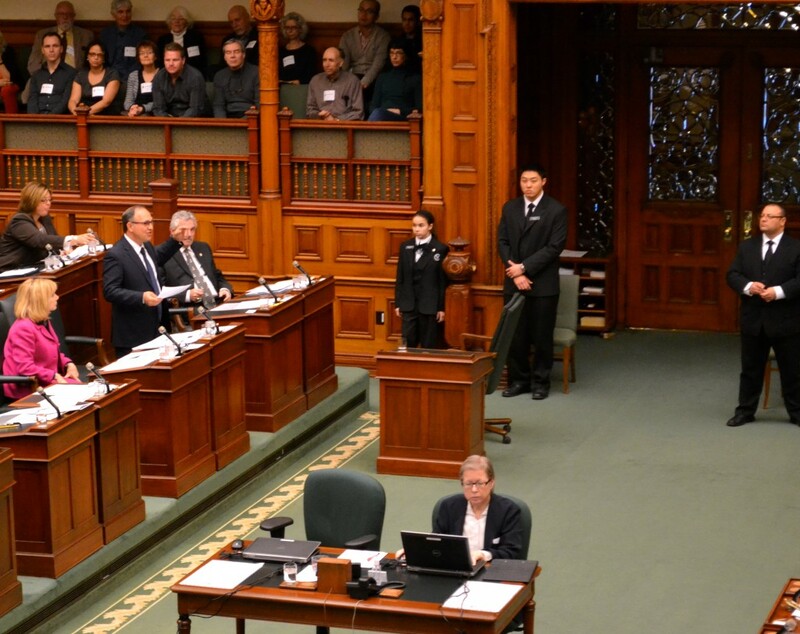 This isn’t the first time Marchese has tackled development issues at Queen’s Park. In May 2012, he put forward a private member’s bill that asked for changes to the Condominium Act. Part of those changes would involve the creation of a review board that would allow condo owners to settle conflicts outside of court. For the bill to pass, it still needs to go through a number of different stages including public hearings before a Committee of the Legislature, a detailed study, a third reading and royal assent. We’ll be following its progress at Queen’s Park.